Jia Liu, Ph.D., has received a $1.86 million grant from the National Institutes of Health to continue her innovative work on the myxoma virus at UAMS. The poxvirus — with its applications for the investigation of disease development, cross-species infection-caused diseases, vaccine development and cancer virotherapy — is the focus of research by Jia Liu, Ph.D., who has received a $1.86 million grant from the National Institutes of Health to continue this innovative work at the University of Arkansas for Medical Sciences (UAMS). The grant is from the National Institute of Allergy and Infectious Diseases and will support Liu’s work for five years. Liu is an assistant professor in the Department of Microbiology and Immunology in the UAMS College of Medicine. She will be studying the poxvirus on the molecular level and how the disease develops. Poxviruses belong to a virus family that includes smallpox. A specific poxvirus that can only infect rabbits, called myxoma virus (MYXV), became particularly interesting to scientists since the 1950s because the virus was used in Australia and Europe as a biological weapon against a species of rabbits called European rabbits. The rabbits were overly abundant and destroying crops. Because MYXV was new to the European rabbits, they had no resistance against its infection. 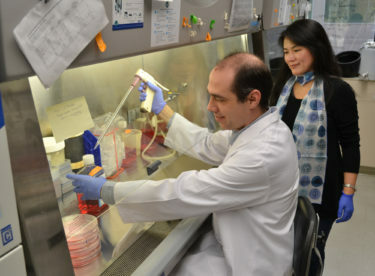 Liu oversees work in the lab. Research associate Richard Connor is pictured in the foreground. Initially, the virus worked, cutting the rabbit population by 99 percent. However, within a decade, the rabbits had adapted to develop resistance to the MYXV infection and their numbers were on the rise again. Meanwhile, the virus was also changing. The incident gave scientists a real-world chance to watch a deadly pathogen (the virus) and its host (the rabbits) adapt in an arms-race fight for the upper hand. With this specific grant, Liu will study the gene function of (sterile α motif domain-containing protein 9, or SAMD9), which was discovered as recently as 2006 to be important for human health. It is now realized that SAMD9 protein is both critical in immune responses against a broad range of viruses and in inhibiting cancer cells from arising. With this five-year phase of funding, Liu’s goals are to understand how SAMD9 contributes to host immunity, how SAMD9 can be blocked by MYXV, and how SAMD9 can play a role in preventing a pathogen from spreading from one species to another. Understanding these details of host immunity and host-virus interactions is important for many reasons. In this globally connected world, outbreaks of diseases, especially those that are new to a population — like MYXV was to the European rabbits — can be devastating. Diseases in one species that adapt to attack a new species are of particular concern. Global health crises like bird and swine flu, severe acute respiratory syndrome (SARS), and Ebola viruses are examples. Vaccines are a main line of defense against viral pathogens and work by awakening the immune system. Better understanding this dynamic through work like Liu’s will improve the ability to develop effective vaccines and keep up with the ever-changing adaptations in both hosts and pathogens. Additionally, Liu’s work could ultimately improve cancer treatments. Many of the advances that led to modern immunotherapies in cancer began with molecular-level research like hers. Oncolytic immune-virotherapy is a novel concept that introduces viruses that can directly kill cancer cells and activate and usher the host’s immune system to attack cancer cells. Liu’s story is another successful example from the UAMS Center for Microbial Pathogenesis and Host Inflammatory Responses, directed by Mark Smeltzer, Ph.D. The center has earned $21 million in funding through the NIH’s Centers of Biomedical Research Excellence (COBRE) program, which aims to provide funding and mentoring to researchers who are early in their careers. Liu was supported by the center for the first three years of her research since she joined UAMS in 2013. UAMS has six COBRE centers, which are launching new scientific careers, attracting top talent and creating concentrations of expertise on topics like neuroscience, cancer therapy, childhood obesity prevention and pediatrics.